I stumbled upon this photo on Flickr. This photo is from Rochelle's Flickr. out of boredom then I saw this. I was really amazed so I Googled it. I don't know where she got it from but other bloggers mentioned that they got theirs from eBay. I didn't want to order from eBay (just because I haven't tried ordering from there yet,ever. lol) so I Googled some more information. I was able to find one seller who's based here in the Philippines but I am sorry I couldn't mention where I got it from because I forgot the website. *lol. silly me* ^^ I will send the seller a message and ask her if I could just post her cellular phone number here. 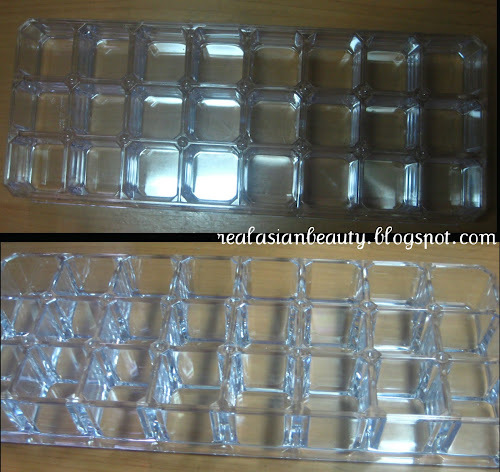 She offers a pretty good deal for only Php150 (about $3) for a 24 pc acrylic lipstick holder and that includes free shipping! Anyway, she was one of the easiest online sellers I've dealt with ever. All it took for us was about 3 text messages and the deal was closed. I deposited the payment at the bank the next morning (Thursday) then got the package at around 2 pm (Friday). This is how the holder looks. It's made of acrylic material and it's clear so it looks neat. 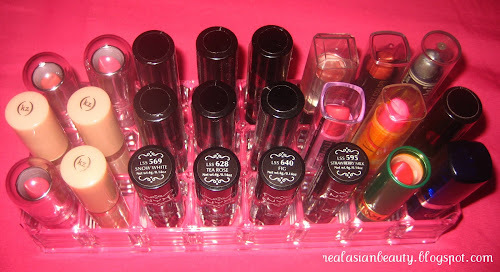 It's perfect for organizing your lipsticks since storing them in drawers takes extra time especially if you are in a hurry because you still need to look at the labels just to find the right shade that you needed. It holds 24 lipsticks perfectly. But based on other blogs I've read, it doesn't work really well with MAC lipsticks since it's bullet shaped so it wobbles around. If you are a MAC lippie lover, I suggest you label the top of the cap so you could store it upright. I don't have many lipsticks yet so a 24 compartment was just perfect for me. If you have MORE lipsticks than I do, then you could get 3 of this or just try to find a 60 compartment on other online shops or on eBay. 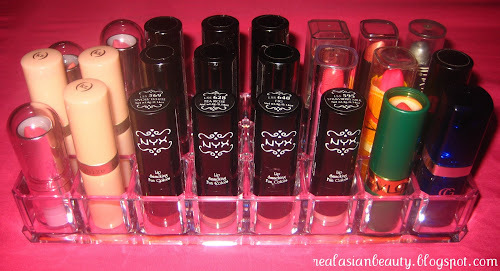 Storing lipsticks like this is fine but wouldn't you rather go for something easier? I mean, it's too much of an effort to open each drawers and check the labels just to find what you want to use for that day. And this is how it looks now! I just love it! Follow this blog for more tips and tricks!